By studying solar energy facilities with pollinator habitats on site, researchers hope to rehabilitate pollinator populations that play a crucial role in the national and global agricultural industries. Loss of such species could devastate crop production, costs and nutrition on a global scale. Though small, insects are at least partially responsible for pollinating nearly 75 percent of all crops world-wide consumed by humans in their daily diet. As man-made environmental stressors – including pesticides and land development – have increased, insect pollinators have lost habitats and species have declined significantly. However, a team of Argonne researchers has been examining the potential benefits of establishing pollinator habitat at utility-scale solar energy (USSE) facilities to conserve pollinators and restore the ecosystem they provide. Looking at over 2,800 existing and planned USSE facilities in the contiguous United States, researchers in Argonne’s Environmental Science (EVS) division have found that the area around solar panels could provide an ideal location for the plants that attract pollinators. Often filled with gravel or turf grass, this land otherwise goes unused. Research has shown that in some locations these grounds offer a perfect place to establish native plant species, such as prairie grass or wildflowers, which are prevalent pollinator habitats, in hopes of encouraging steady population growth. Helping to conserve declining pollinator populations, EVS researchers Lee Walston, Heidi Hartmann, Shruti Khadka Mishra and Ihor Hlohowskyj, along with National Renewable Energy Laboratory researchers James McCall and Jordan Macknick believe that growing pollinator habitat around solar sites will also help improve the sustainability of solar energy development in agricultural regions. By increasing the ability of pollinators to pollinate adjacent agricultural fields, solar-sited pollinator habitat may boost farmer’s crop yields and make solar farms a more welcome neighbor to agricultural farms. The researchers examined whether solar-sited pollinator habitat could benefit agriculture in a recent study published in Environmental Science & Technology. The study found over 3,500 square kilometers of agricultural land near existing and planned USSE facilities that could benefit. Walston believes this method of rehabilitation could help reinstate the declining pollinator population with few subsequent side effects. “Solar-sited pollinator habitat can help optimize the land-use efficiency of solar energy developments, while not compromising solar panel efficiency,” he said. “We’re also looking into whether the high upfront costs for seed mixes and establishing the pollinator habitats will be offset by lower facility maintenance costs,” added Hartmann. This – along with widening appreciation among community members and local governments for the pollinators’ role in agricultural production – may persuade solar developers to make the switch. Walston and Hartmann looked at three example crop types to measure the agricultural benefits of increased pollinator habitat. These crops – soybeans, almonds and cranberries – depend on insect pollinators for their annual crop yields. If all existing and planned solar facilities near these crop types included pollinator habitat and increased yield by just one percent, crop values could rise $1.75 million, $4 million and $233,000 for soybeans, almonds and cranberries, respectively. 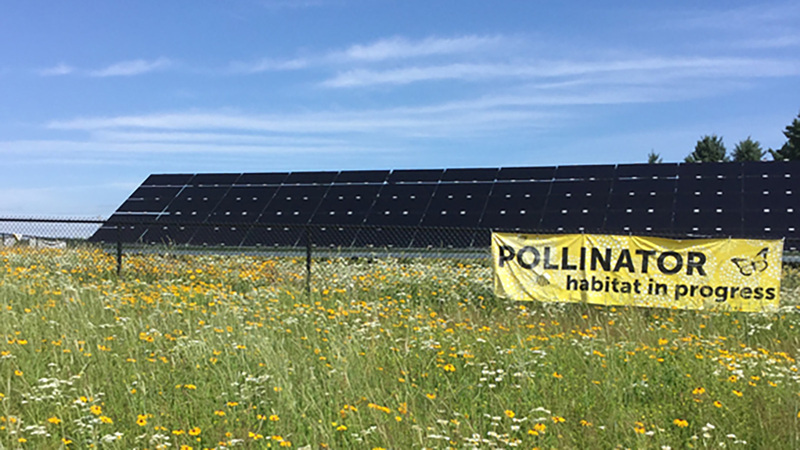 Walston and Hartmann’s research is the first to quantitatively support agricultural benefits of adding pollinator habitat at solar facilities. Next, said Hartmann, the team will begin fieldwork that measures the type and numbers of native pollinators in areas surrounding USSE facilities. This study provides even more opportunities for investigating the environmental benefits of pollinator habitat, such as water conservation, land management and carbon dioxide reduction. With more states recognizing the need to address pollinator population declines through legislation, more solar facilities are making the switch to pollinator-friendly areas. Argonne’s very own state of Illinois recently passed a ​“Pollinator-Friendly Solar Energy Bill” at the end of May, joining states like Maryland and Minnesota, which have made similar legislative progress toward a more ​“landscape compatible” future. The research was funded by the U.S. Department of Energy Solar Energy Technologies Office within the Office of Energy Efficiency and Renewable Energy. The Office of Energy Efficiency and Renewable Energy supports early-stage research and development of energy efficiency and renewable energy technologies to strengthen U.S. economic growth, energy security, and environmental quality.